As they say, all the world is a stage. However, on a bollywood movie set it is a whole new experience altogether. The stage becomes a new worldly experience. And this is what I want to describe through this article. Having had an opportunity recently to be a part for shooting a scene for a new bollywood movie set to release next year, I thought I should share this experience with my readers. What we see on the big screen at the theatre or dvd’s is just a three hour movie. The real experience is actual hard work, lots of dedication and coordination. A few glitches can cause the whole movie budget go astray and the release date go off track. The whole process of making a movie can take from 6 months to couple of years. The movie requires any number of crew members – editors, storywriters, lyricists, cinematographers, set designers, costume designers, sound recorders – actors and hundreds of junior artist’s if there are scene’s demanding a lot of people. The behind the camera team is the one which has the bulk of the work including the spot boys and each person has to do his role in perfect coordination with others and that is one of the reason, that many people in the direction team have walkie talkies to connect with other members of the team. As I reached the location on a weekday morning, I was greeted by the production team. There were lots of junior artists getting ready for the shoot. The makeup & costume team was at work, making sure every character in the painting auction scene gets a costume according to their look. They wanted people of middle age group, so there were quite a few people required for the scene. I had already got a suit for myself as I was told by the casting director to get one. So, I was ready for the makeup part. Thankfully, the makeup was minimal and I was ready to go to the set with the rest of the artists. 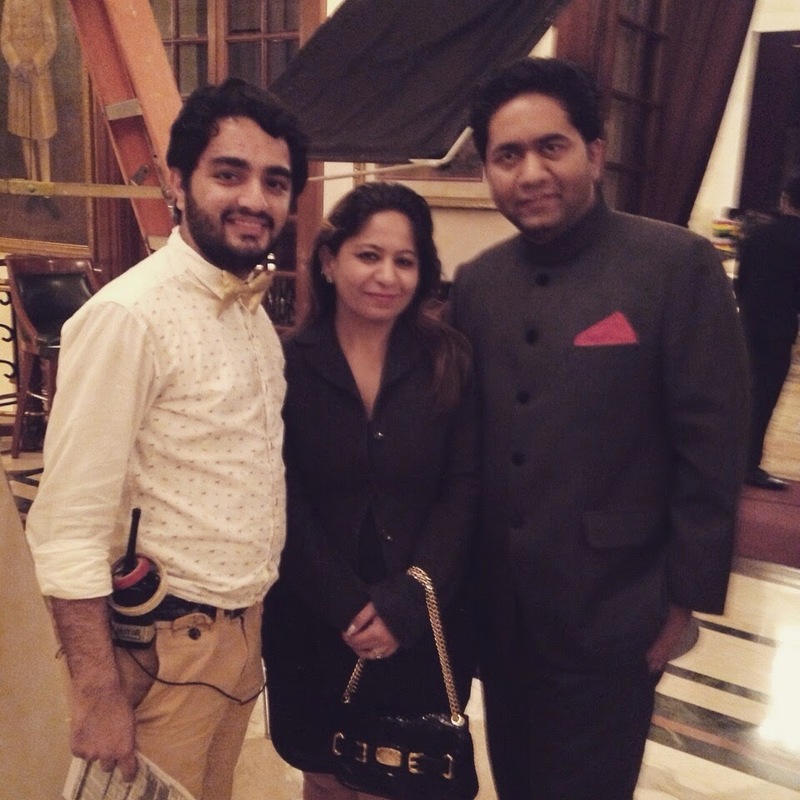 The set was in a ballroom of a five star hotel in delhi. It was well lit up and you could make out that the set was ready. There were three cameras at the front. The direction team guided the artistes to their respective seats at the auction set. The direction team gave a brief to each artist about the scene that was to be shot and what role they were required to do. Many of the people in the room were excited to be a part of the film and had voluntered to come through someone in the production team. Few were familiar faces who were regular junior artistes and few of the people were from the drama club in delhi who had come on a daily wage. It was really interesting to see so much excitement at every shot, even though many people knew they would not come in the camera frame, they did go on and do their part to the best of the ability. After, everything was ready, it was time for the lead actors to come to the set. One crew member told us, that the maximum rush he has seen has been when Salman Khan was shooting. The guy has a mass appeal. There were instances where few people on my table were discussing about the next movie shooting happening in delhi, I assumed that they must be regulars coming for these kind of shootings. Some of the people were very talkative and were blabbering throughout the scene, it helped that the shot required them to act if they were talking to each other. Finally, the director then briefed the lead actors of what was expected from them.Soon, the director said action, and the camera was ready to roll. After quite a few retakes, the director seemed happy with the shot. To my surprise one scene took around a couple of hours to shoot. There were three cameras and shots were taken from separate angles so they could be used by the cinematographer at the editing stage. It was very important for the director and cinematographer to be happy with the shots in order to ensure that they didn’t need the scene to be re shot on another day. This would waste another day and cost a little more to the producer. There were lot of stills that were also taken by the team. There was a lunch break and lots of tea/coffee breaks throughout the day as the direction team prepared or changed the set according to each new scene. It was a great experience to actually see how the whole process takes place. The coordination and control needs to be perfect and since it was a big production house, they were really professional about the whole thing. The set was very well organised and each detail was taken care to the full. After all these scenes were shot, the movie would go for editing and most of the shots that would not be required would be deleted. This meant that no one was sure that they would actually come in the scene or not as they were lot of tables and lots of people. We got to know that the crew had shot for a month in Kashmir and after Delhi they were going to fly to Mumbai to complete the rest of the shoot. We were very happy to see a rising star who was now part of the direction team for the film. Yes, the ‘kuch kuch hota hai‘ kid who said the famous dialogue in the blockbuster movie ‘tusi jaa reh ho,tusi na jao’ to Kajol, and we didn’t miss an opportunity to get clicked. To sum it up, a lot of hard work goes into making a movie. It is a team effort which requires a lot of coordination and patience. The crew has to stay away from home for so long and have outside food. It’s such a tough experience for them and it requires a lot of hard work and dedication. I realized that as an audience, most of us do not have an idea of what all goes into the making of a film. The fate of a film is decided in few weeks. I realized what the whole team would have gone through if the movie doesn’t fare well at the box office. But then that is part of life and some movies work and some just don’t. What the team can do is that they put in their best and hope that their efforts are appreciated and liked by people. After this experience, I can say that behind the glamour, it takes a lot of hard work and commitment to be an actor. And Cut!